This strange phenomenon is depicted by the ouroboros, which for millennia has represented a cycle of constant renewal, of self-fertilization, and ironically, of immortality. According to Christopher Cole, founder and CIO at Artemis Capital Management, it also represents the current situation in financial markets where stability and asset price gains have created a feedback loop encouraging more aggressive bets on low volatility and low interest rates, which in turn makes these strategies more and more lucrative. It's hard to argue the world isn't manic right now. Global central banks have pumped $15 trillion in cheap money stimulus into capital markets since 2009. Long-term government bond yields are at the lowest levels in recorded human history. As of last summer, there was $9.5 trillion of debt carrying a negative yield. Austria issued a 100-year bond in September with only a 2.1% coupon. The S&P 500 rose on a total return basis in each month of 2017 for the first time ever and has climbed in 21 of the last 22 months. 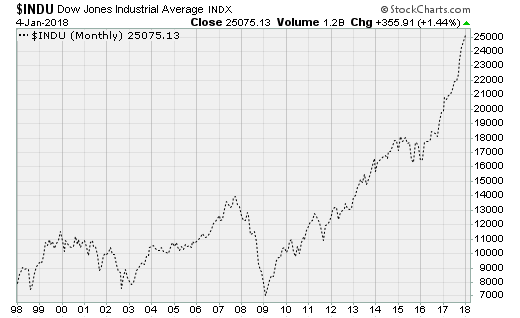 The Dow Jones Industrial Average just crossed 25,000. The NASDAQ, 7,000. The only time stocks have been more expensive, on a cyclically adjusted price-to-earnings basis, was in the final stages of the dot-com bubble. Corporate profits remain below the highs hit more than three years ago. When the Dow was trading near 18,000. Private market unicorns are badly overvalued. Corporate leverage is extremely high. Private markets are drowning in cheap cash. Underfunded pension plans are taking more aggressive bets on alternative assets in a desperate attempt to close asset-vs.-liability deficits in a low-return world, increasing the likelihood of a taxpayer bailout when it all goes sideways. And the tail-eating dynamic seems to have accelerated over the last couple of months, as asset prices become more extreme and startup ideas more bizarre. Bitcoin's rise has eclipsed the Dutch Tulip Mania, as crypto true believers bounce between bitcoin, Bitcoin Cash, Ethereum, and Ripple, chasing momentum as new coin-based billionaires are created seemingly overnight. Ripple's founder, for example, is now worth more than Mark Zuckerberg. Struggling publicly traded companies are enjoying huge rallies by simply adding "blockchain" to their name. Doug Evans - the Silicon Valley entrepreneur behind the $400 Juicero press that squeezed juice from $8 bags of fruits and veggies about as well as your hands could - is making a comeback as one of the proponents for "raw water," which is unfiltered, contains no additives and turns green from microorganisms if left too long. You know, ones like Vibrio cholerae, the bacteria that causes cholera and kills upward of 143,000 people per year, according to the World Health Organization. But is the fever about to be broken? It's not just independent hedge fund managers like Cole who are sounding the alarm, but also Wall Street stalwarts including Societe Generale and Bank of America Merrill Lynch. The former is looking for the S&P 500 to drop to 2,000 by the end of 2018, a loss of 26% in what would be a bear market decline. The latter, courtesy of chief investment strategist Michael Hartnett, fears a 1987/1994/1998-style "flash crash" within the next three months caused by a withdrawal of central bank support as interest rates rise, ending a 50-year low in stock market volatility. The Eurasia Group is warning of geopolitical risks in the new year, with a focus on hot spots like North Korea, Syria, Russia and now Iran. Cole blames a dynamic of self-reflexivity that is filtering down to private markets, as investors of various types in different securities are all taking a "short bet" on volatility in a bid to boost returns. These could be explicit bets, such as option overwriting by pensions, or implicit bets, such as risk parity funds and allocations to Commodity Trading Advisors. 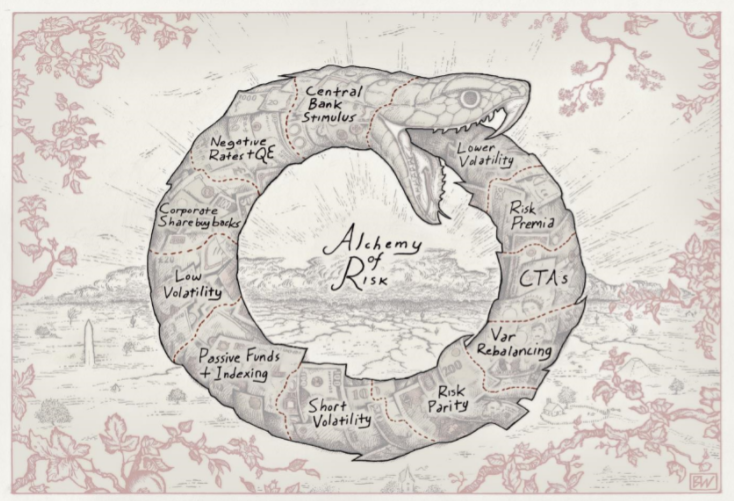 "The investment ecosystem has effectively self-organized into one giant short volatility trade, a snake eating its own tail, nourishing itself from its own destruction. It may only take a rapid and unexpected interest in rates, or geopolitical shock, for the cycle to unwind violently." The lynchpin, by Cole's reckoning, would be a persistent rise in inflation that would prevent central banks from riding to the rescue with more cheap money stimulus. This would also push bond yields higher, cutting off the flow of corporate share buybacks, which in his estimation now total upwards of $800 billion a year. Key antecedents suggesting we're nearing that outcome include the closing of the post-recession potential GDP output gap (meaning the economy is running above its "speed limit") and the ongoing tightening of the labor market. And this comes amid a need to roll over some $300 billion in high-yield corporate debt between now and 2020. No less than the International Monetary Fund recently warned that 22% of US companies are at risk of default should there be even a modest rise in borrowing costs. In an interview last week, Cole admitted that the risk doesn't necessitate the outcome: "Keeping a barrel of nitroglycerin in your office is a terrible idea, but you could do it and maybe not get hurt." But the trigger of a 2% to 3% rise in interest rates within, say, a six-month period has happened many times before. Like in 1987, just months before the Black Monday crash. And is likely to happen again. His key takeaway? The post-recession environment of ultra-low yields has forced pensions and other limited partners to desperately reach for yield, thus encouraging investment professionals to indulge in aggressive financial engineering to boost returns. On the surface, it looks like downside risks have been destroyed—papered over by ultra-low interest rates. But he said they've only "shifted it in form and time creating new and unique fragilities as they try to transmute what cannot be changed."